The second update of 2010 brings my typical mixed bag of recordings. The first is an unusual recording by the wonderful British baritone Dennis Noble. It is not listed in the discography of Noble which appeared in The Record Collector in 2004. 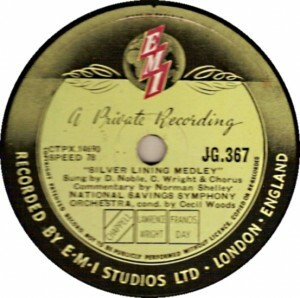 The record label is a private EMI pressing made to promote the National Savings scheme. The songs on one side are a “Silver Lining Medley”, and on the other “Look for the Silver Lining.” These were presumably chosen to tie in with the film “Look for the Silver Lining”, a 1949 biopic of Marilyn Miller. In the medley, Noble sings two songs, and C Wright (a very English tenor crooner) sings another. A fourth is assigned to the chorus. The second side has Noble singing with the chorus. Both sides are introduced by actor Norman Shelley. Next, from around the same time, a British conductor in the US – Eugene Goossens with the Cincinnati Symphony Orchestra in Delius’s The Walk to the Paradise Garden. Some decades before, a Russian conductor made recordings in the US – Vassily Andreyev took his Balalaika Orchestra on tour there in 1911. One of the sides he made has appeared here before, when it was a coupling for Landon Ronald’s abridged recording of Schubert’s Unfinished Symphony. An altogether different sound comes from an early single-side Zonophone of Fucik’s “Entry of the Gladiators”, recorded a little before it acquired its circus connotations. The Zonophone Military Band credited on the label are actually the Band of H.M. Colstream Guards. Maintaining the Czech theme, Dvorak’s New World Symphony receives a compelling performance from Jascha Horenstein on a Vox LP. The tempi are perhaps slow in places, but the conductor’s attention to detail makes for a highly satisfying account. Finally, making a long overdue appearance here, the American conductor, Dean Dixon. I have more recordings by Dixon than can be given here – many are still in copyright, as he continued recording into the 1970s. The three LPs here include two symphonies by Schumann, two by Schubert, and Schubert’s Rosamunde music. Download – Silver Lining Medley – Dennis Noble, etc. Download – Look for the silver lining – Dennis Noble, etc. This recording plays just sharp of A major at 78rpm and, in A flat major at 73rpm. Transposition up to B flat major seems unnaturally fast, and A is an unlikely key for a military band. The piano score of the piece is in C major. Reviewed in Gramophone, November 1953, where it was found to be better than recordings by Jorda and Kubelik.